I don’t find very many books at random anymore—I’ve become a “request and pick up” reader rather than a library browser, mostly. But…sometimes I’m short on books and that requesting does take time. And sometimes I find a gem just by picking it up. 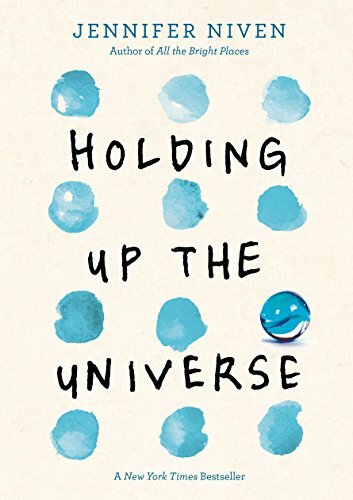 Such is how I found Holding Up the Universe by Jennifer Niven, a troubled teen story with teens with unusual troubles. Jack has face-blindness—he can’t recognize anyone, even his mother or two brothers. He navigates through life by remembering key details (his brother is skinny with big ears, his girlfriend has a very helpful fake beauty mark), hiding his challenge from everyone. Libby went viral in an online video in the worst possible way—as a morbidly obese teen who had to be cut out of her house. Since then she’s lost weight but remains large (and feels comfortable at her current size), and is now facing a return to high school. When the two end up thrown together, they each see the other in unique ways. This was a fascinating book. I don’t like troubled teen books as a rule, but this was not your run-of-the-mill troubles. I’m so intrigued by Jack’s face-blindness. His particular situation is extreme, but it’s a real thing that a surprising number of people have (and surprising people: Jane Goodall! Brad Pitt!) The book is in alternating POV, and I loved seeing the world through Jack’s eyes as he navigates a world that is always full of strangers. Libby may be a contender in nine months for my favorite character of the year. She’s done a lot of hard work in the last few years, losing weight of course but also (and more to the point) work on self-image and self-confidence. Her over-eating was brought on by her mother’s death and bullying, so that’s hard issues right there. As she returns to high school, she is simultaneously totally confident in herself, and totally afraid of trying to be that self out in the world. I think my favorite thing about Libby is that she’s scared and fierce. She gives as good as she gets when things get hard at high school (you know they will) even while reeling emotionally. I love this both directions–that someone who is scared can still be fierce, and the reminder that someone who is fierce might still be scared. If all that isn’t enough, Libby also writes book quotes on her shoes to help herself be brave. LOVE IT. In a way, Jack’s and Libby’s paths are inverse. Libby is sure of her identity but has to learn how to be that person in the world. Jack gets on great in the world, having perfected the art of being Mr. Hail-Fellow-Well-Met, but has to do some hard work to become his true self. Libby’s resolution is brilliant and satisfying. Jack’s felt a little rushed but I liked where it went. Also there’s a love story, of course, which walked a really interesting and satisfying line. Neither character completes the other, falling in love doesn’t solve their problems, while at the same time they do support each other on their respective paths…with some missteps and apologies and trying again. I like all of that. This one fits my diversity goal in that Jack is half African-American (with a giant afro he grows so he can recognize himself). But race is a relatively minor aspect, and I feel like this was a much better broader diversity book, with a heavily overweight heroine and a non-neurotypical hero. For a book picked up at random, major win, and highly recommended. I love it when random picks turn out so well! And Bone Gap by Laura Ruby also features a main character with face blindness. I highly recommend it, if you haven’t read it already.